With only two points separating the top four, everything was in place for the closest finale to the V.E.S. league in years. With so many people in the mix, the draw would play a massive part in who would be crowned champion, not only who drew the better pegs but who was drawn with who in each section and if came down to a tie, total combined weight could also come into it – this one was going down to the wire! We met at the bowling club for breakfast and after everybody was fed and the pools were paid, it was time for the draw with all the anglers hoping to see the numbers 125 or 126 on their ping pong balls. Big Frank was in charge of the draw bucket so I took the opportunity to go in fairly early and grabbed a ball but didn’t look. Rob also drew early and when he looked he was on 129 which hasn’t been great, I had a peek at mine and 112 was my home for the day, not the best although I’d had a nice day on it a few weeks back when the river had been up and coloured. My chances of a league placing were slipping away unless Terry and Digger had also drawn badly, but that faint glimmer of hope was soon extinguished when Terry wrote his name next to 125 and Digger owned up to being on 126. Mathematically, third place in the league was still achievable if I could score two or three points and other results went my way so I would be giving it my best shot. 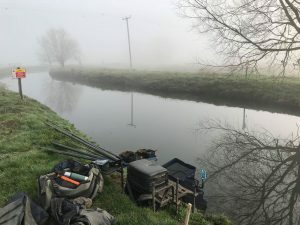 It was foggy start but the forecast later was for a bright and sunny day which, although nice for the anglers, wasn’t ideal fishing conditions, especially coupled with a low and clear river. Dave P was on 109 above me and Jake was in the weirpool which he said he fancied. I set up a 0.75 gram bodied float for down the middle of the peg and a 0.5 gram DH16 for the far side. On the side tray I had red and bronze maggots, casters and Bait-Tech Super Seed hemp. I was ready in plenty of time so had a quick chat with Dave before popping down to see Jake and as always, the weirpool peg looked really nice and I felt sure he’d have a few today. Back at my swim I had a coffee before shouting the all in, I started with double red maggot down the middle, feeding hemp and caster just upstream as well as across but after half an hour I hadn’t had an indication of any sort, not even a minnow! I’d wanted to leave the far side as long as possible before going over but had a quick go just to see if I could get a bite but nothing and I had a horrible feeling the writing was on the wall already. The early mist had gone and was replaced with blue skies and blazing sunshine, unbelievable weather for February! I plonked the pole in the rest with the rig in the water and had a coffee, there were loads of tiny fish in front of me and I didn’t think they were minnows, a great sign for the future although that wasn’t going to help me right now! Where were all those dace, chublets, roach and gudgeon I caught here a few weeks ago? I’m sure they’re still there but just won’t feed unless the river is carrying some colour. I still thought I might get a few but probably not until the ‘golden last hour’ when the light starts to fade. It was time for a walk, I lifted the rig up and there was a tiny minnow on the end so at least the blank was avoided! 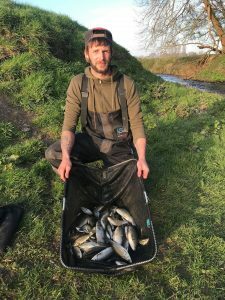 I walked up to Dave and he was only getting minnows as well, I then headed down to Jake and he said he was getting a few and while I was behind him, he had a bite a chuck from quality dace, chublets, small roach and gudgeon and was on for a good weight. Leaving him to it, I headed back and knew I needed to find some chub if I was to do any good today. To be honest I was going through the motions a bit and it felt like the swim was devoid of fish (but I bet it wasn’t!). After about two and a half hours, I was fishing across with caster on the hook, when all of a sudden, there was a little dink on the float, it dipped and slid away and I struck and was just waiting for my Preston 13 Hollow elastic to come streaming from the pole tip. It didn’t happen and a rather shell shocked minnow skipped along the surface as I shipped the pole back! Now, I could give you a blow by blow account of how I caught nothing (apart from another minnow) over the next two hours but that would be as boring for you to read as it would be for me to type so let’s just skip to the last hour when hopefully the chub might start to feed. I started upping the feed in readiness for the chub bonanza but you can probably guess what’s coming next? yep, nothing, nada, zilch, not a bite! Adie won our section by double default with 2lb from 124a and Steve Maynard at least covered some of his fuel costs after the long trek up from Cornwall when he won the other section with a nice net of quality roach weighing 6lb 10oz from 128. So after a very close league all the way through, it ended with a photo finish and came down to overall weight deciding it with Terry just edging it over Digger. A great result for ‘The Toast’ especially as he missed a match, well done to the top three. So another really enjoyable league full of twists and turns right up until the end, I felt for Rob who had led for so long but the draw bag can be cruel sometimes. On a personal level, I was gutted to miss out again, especially after last week’s disappointment of finishing second in the Warehouse League. There are such fine lines between success and failure, looking back at my league, I had 5lb 9oz for 4 points in the first match with Terry beating me by 3oz for a point, I had 11lb 2oz in the second round for 5 points! but just 2oz cost me another point and in round five I had 8lb 5oz only for Terry to nick another point off me by 3oz! Saying all that, even if those results had gone my way, I still wouldn’t have beaten Digger in the league! Before I go, the club would like to say a huge thanks to V.E.S. Precision for their much valued and continued support and to Ilminster Bowling Club for looking after us in the mornings, it really is appreciated and I would like to thank all the anglers who’ve helped in anyway and for making it such a great little league to fish. 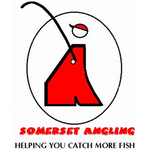 Somerset Angling began life in quite an unusual way in 1993. 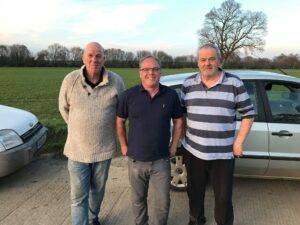 Mike Stone, Steve Kedge, Brian Reed and Baz Morgan met for an Indian meal at a restaurant in Bridgwater. All are keen competition anglers and Mike had just won the prestigious Kamasan matchman of the year and was about to become an international. Amongst all the usual joshing was the semi serious suggestion that we would open a fishing tackle shop in Bridgwater. 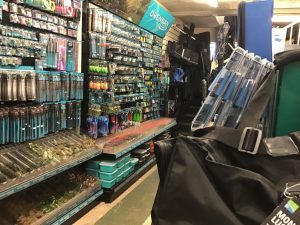 A series of meetings took place and Somerset Angling began trading in a small area of a post office in Bath road. Baz already had the benefit of experience in the trade with his shop in Langport while the other three had managerial experience in other businesses. They were warned by several people ,including some in the trade that they were out of their minds and certain to fail, wasting their time and money. It didn’t work out like that and despite limited capital the shop was successful more or less from day one. 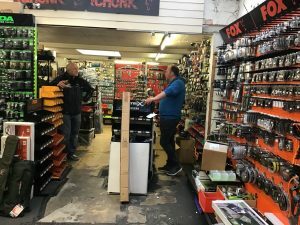 Fortunately as the business grew the adjacent shops became available and the business was able to expand. After a few years Brian left the partnership (amicably) to pursue his other business interests leaving the current three partners. Steve has managed the shop from day one and we are lucky to have had and still have excellent staff. Matt and Simon are relatively new whilst John has been with us for over 20 years during which his knowledge of specimen fishing has been invaluable. 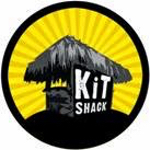 We have only ever employed keen anglers to try to maintain our claim of being a shop run by anglers for anglers. 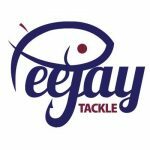 Of course we have to make money to survive and pay our outgoings but we will always try to help with advice on tackle, venues etc in particular to try to help anyone beginning to fish or is relatively inexperienced. 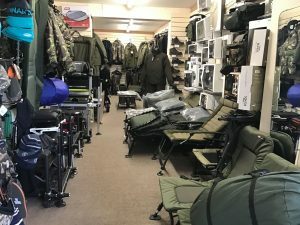 We are grateful to all our customers who supported Somerset Angling over the years and we hope to have many more years in the trade plus of course welcoming any new custom. Of course we are sometimes very busy but will always try to maintain that personal touch. Tight lines Mike, Steve, Baz, Matt, Simon and John.